June 13, 2016, 3:00 PM · In a way, Montreal International Violin Competition first-place laureate Ayana Tsugi was following in the footsteps of her father, Masahiro Tsuji, when she started playing the violin at age three. "We both were Suzuki kids," said her father, who also started violin at age three in the Suzuki method (in fact, Ayana told me that he studied in Japan with the late Shinichi Suzuki). Ayana also started in the Suzuki method, and though her father is not a professional violinist, he has been a driving force behind Ayana's hard work on the violin. Ayana Tsugi and her father, Masahiro Tsugi. Photo by Violinist.com. A native of Ogaki in central Japan, Ayana has been performing in competitions from a young age, winning numerous prizes. She began the international competition circuit around age 10, at the Osaka International Music Competition in 2008. Since then she has performed and won prizes in major international competitions, including second prize at the 2013 Music Competition of Japan in Tokyo; best performance of Paganini at the 2014 International Violin Competition of Indianapolis; fifth prize at the 2015 Joachim International Violin Competition in Hannover; and second prize (top prize) at the 2015 Seoul International Music Competition. In the Montreal International Music Competition earlier this month, she not only won first prize but also five special prizes. 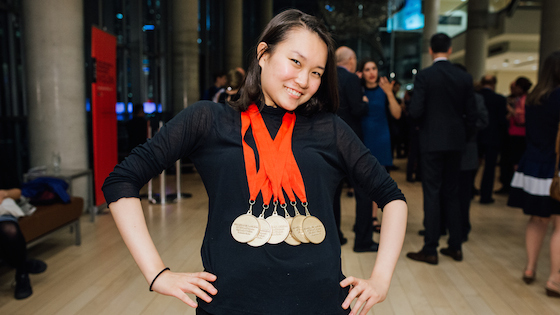 Ayana Tsugi won six medals at the Montreal International Musical Competition 2016. Photo by Tam Lan Truong, courtesy of CMIM. For Tsuji, competitions are stressful and nerve-wracking experiences which she does not enjoy -- until she gets on stage. For the Montreal competition, her mother stayed home in Japan because she was too nervous to be there. Tsuji also barred her father from being in the audience; she made him stay backstage because having him there in the audience to hear any mistakes was too stressful, she said. More than anything, she concentrates on the audience. "Before the performance, backstage, I am so nervous," Tsuji told me in an interview after the Montreal Gala concert. "But once I start playing, I'm not as nervous. I like performing, I like playing. I like listening to the audience. I'm not thinking about 'I have to win I have to win...' No, no. I want to play music when I'm playing in a competition." Competitions have other benefits, too; "I learn so many things from competitions, because I can listen to accomplished performers," Tsugi said. Winning in Montreal was a pleasant surprise, she said. It wasn't a surprise to those who have been following her young career. Tsuji, who plays a c. 1850 Jean Baptiste Vuillaume, plays with poise and maturity. Her artistry in the Joachim competition was praised last year by our Violinist.com reporter Heather Kurzbauer, who said that Tsuji "is an artist of consummate taste and persuasive musical power. Her g-string passages burned with inner fire, octaves were freed from the box of pure technical exercise and each and every phrase was treated to a special ending in order to make room for the subsequent musical idea. Tsuji’s second movement could open the gates of a rainbow-infused heaven while the atavism that inspired her third movement brought listeners to the edge of their seats. The great discovery at this year's contest comes in the form of a diminutive phenomenon: Ayana Tsuji." Tsuji's current teacher, Koichiro Harada at the Tokyo College of Music, watched her Montreal performance online, then sent her an email afterwards: "Bravissimo!" Harada, she said, tends to be positive with his feedback, to tell her "Good." Her father, who practices with her, is more often the one to say during practice, "Bad!" she told me, with a laugh. And she practices a lot. "When I was a child, I liked to play the violin, but now, I must play the violin," she said. Every day she practices for five hours, although when she has a competition, the practice time increases to eight hours a day. It is tiring and it is difficult, but one thing keeps her motivated, she said, "Every day when I practice, I imagine I'm playing with orchestra, and I imagine I'm playing for an audience," she said. "That way, I enjoy every day." What is her favorite music to play? "I like Mozart -- Concerto No. 3," she said. "It is such a beautiful piece." In the future, "I want to become a soloist with orchestra and I play all over the world," she said. "I want to play at Carnegie Hall!" For those who want to learn more about why Tsuji won so many medals, one place to look is her quarter-final Montreal performance, in which she played Bach Partita No. 1; Paganini Caprice 21; Ernst "Der Erlkönig"; Saint-Saëns "Introduction and Rondo Capriccioso." Her Bach had refinement, with well-placed decorations and elegant sense of style; she just absolutely nailed the Ernst, with satisfyingly in-tune double stops throughout, enviable up-bow and down-bow staccato and a sense of direction and line that gave sense to all that virtuosity. Her Saint-Saëns was well-timed with just the right combination of energy and restraint (and by the way, excellent accompanying by pianist Philip Chiu). June 13, 2016 at 10:45 PM · Being able to stand up straight with all six medals hanging from her neck is a good sign should she ever wish to take up the banjo. June 17, 2016 at 08:25 PM · After having been in the company of two of the World's Greatest (if not The Greatest) Violinist's of All Time), Jascha Heifetz and Nathan Milstein, both of whom I was privileged to study with at differing times, firstly in Los Angeles and later, in London, UK, following the splendid teaching of my late father, Ralph Matesky, (former ASTA National President), who was the honoured guest of Japan's JASTA President, Professor Iwafune, to give Musical Forum's on Music and Violin Playing in America, in Tokyo at amongst other music institutions, the Toho School, I wish to convey my deepest compliments to the teacher/father, Mr. Tsuji, of First Prize Winner of the 2016 Montreal International Violin Concours, Ayana Tsuji, who obviously has given his daughter a remarkable violinistic and musically sensitive foundation which, in my view, is at the root of Ayana Tsuji's great success in the Partita No.1 in b minor for Unaccompanied Violin of Johann Sebastian Bach, not to mention the utter discipline and innate sense of timing in all the repertoire Ms. Tsuji performed including a musically enchanting account of one of Paganini's toughest Caprices; her remarkable mastery & joie di vie in Saint Saens Introduction & Rondo Capriccioso, and the devilish quality displayed in her masterful conquering of the Ernst! For the first time since the onset of Hilary Hahn, I can actually state my feeling of admiration for and in the young Violin virtuoso with true musical lyricism pouring forth from the circa 1850 J.B. Vuillaume violin in the hands of Ayana Tsuji! I believe both my legendary violin mentor's would be excited by Ayana Tsuji's formidable accomplishments and wave her on ~ Surely, Japan's young Violinist, Ayana Tsuji, will reach her goal to perform in Carnegie Hall in New York, in my own country! June 17, 2016 at 09:16 PM · As a pupil of both Jascha Heifetz and Nathan Milstein, (& with Milstein, privately, for 3 & 1/2 years at his Chester Square home in London), with a now matured appreciation for my first teacher, my father, Ralph Matesky, without whom none of my musical overviews would have been possible, I wish to pay my deepest compliments and respect to the teacher/father of Ayana Tsuji, Mr Tsuji, upon his daughter's 2016 Montreal International Violin Concours First Prize win including 5 other special prize categories! Having submitted a 'drop in' reply prior to this, allow me to reiterate previously penned praises of young Ayana's remarkable violinistic and musically sensitive foundation which I believe (and know) is at the root of her successes in her performances of J.S. Bach's Unaccompanied Partita No. 1 in b minor for Violin; in a lovingly genuine musical account of one of Paganini's toughest Caprices; in her Joie di vie portrait of Saint Saens Introduction & Rondo Capriccioso with superb timing; and in her devilish qualities innately dispatched which enabled her accompanying masterful conquest of the Ernst 'summit'! A wonderful Father's Day to the wise father of Ayana Tsuji and her dear Mother in Japan! June 17, 2016 at 09:17 PM · As a pupil of both Jascha Heifetz and Nathan Milstein, (& with Milstein, privately, for 3 & 1/2 years at his Chester Square home in London), with a now matured appreciation for my first teacher, my father, Ralph Matesky, without whom none of my musical overviews would have been possible, I wish to pay my deepest compliments and respect to the teacher/father of Ayana Tsuji, Mr Tsuji, upon his daughter's 2016 Montreal International Violin Concours First Prize win including 5 other special prize categories! Having submitted a 'drop in' reply prior to this, allow me to reiterate previously penned praises of young Ayana's remarkable violinistic and musically sensitive foundation which I believe (and know) is at the root of her successes in her performances of J.S. Bach's Unaccompanied Partita No. 1 in b minor for Violin; in a lovingly genuine musical account of one of Paganini's toughest Caprices; in her Joie di vie portrait of Saint Saens Introduction & Rondo Capriccioso with superb timing; and in her devilish qualities innately dispatched which enabled her accompanying masterful conquest of the Ernst 'summit'!